We were wait-listed on the tour we selected for today. We hadn't heard anything by the time we got back from dinner, so we thought we didn't get it. We were all ready to sleep in, but just before we went to bed, Ray decided to put the do not disturb sign on our door. When he did, he found our tickets for today in our "mail" slot. The tour, "Da Nang and Marble Beach", was scheduled to leave at 8am, so we had to set the alarm for an early wake-up and order breakfast in again. We crawled out of bed and made it to the bus on time this morning. 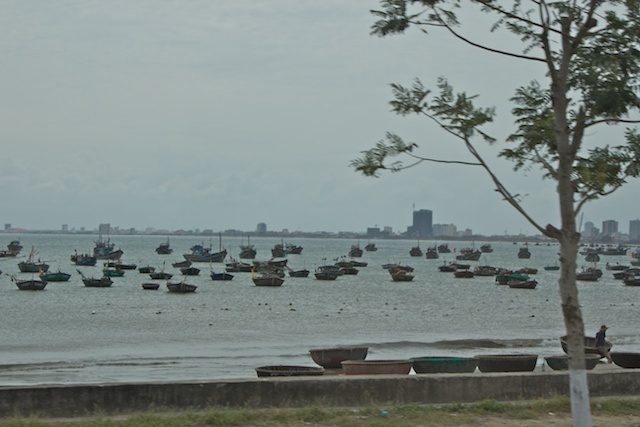 Yesterday we traveled north from the port to Hue, so today we got to head south to Da Nang. Our guide talked a lot about the cultural differences between people in Hue versus those on Da Nang and other areas of Vietnam. It was very entertaining. One surprise on our route was that a tunnel 4 miles long has been built under the mountains between the port and Da Nang. It used to be a long drive over the mountain, and it still is for hazardous trucks and motor bikes. Only cars, buses and trucks are allowed to go through the tunnel. There are trucks on either side that will take motor bikes through for a fee. This tunnel cut the travel time to the other side of the mountain to 10 minutes. Our first stop was to the Cham Sculpture Museum. The Cham were people who lived in central Vietnam around the 13th century. 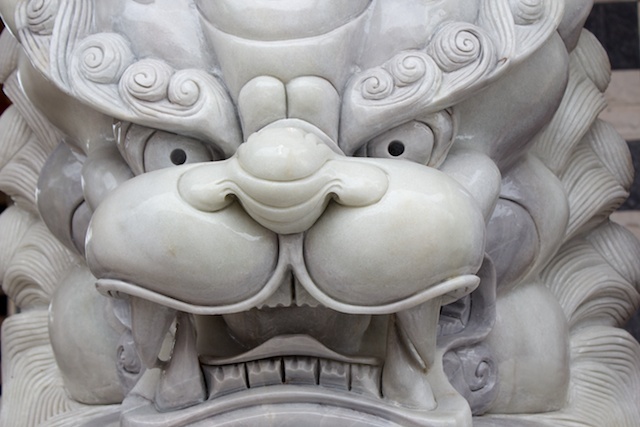 They were Buddhist and the stone sculptures in the museum mostly reflect Buddhist themes. When we left the museum there were cyclos waiting to take us for a ride through the city to the market area. 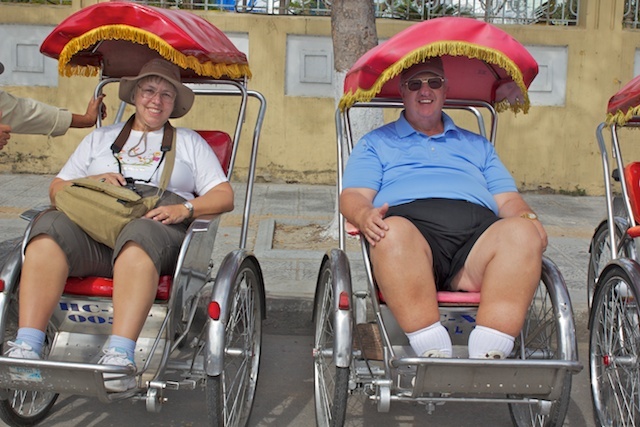 A cyclo is the Vietnamese version of a rickshaw, as you can see from the photo. The cyclist pedals from behind. This ride was a fun adventure, weaving through city traffic. I videoed the whole ride. Next stop was an embroidery shop. 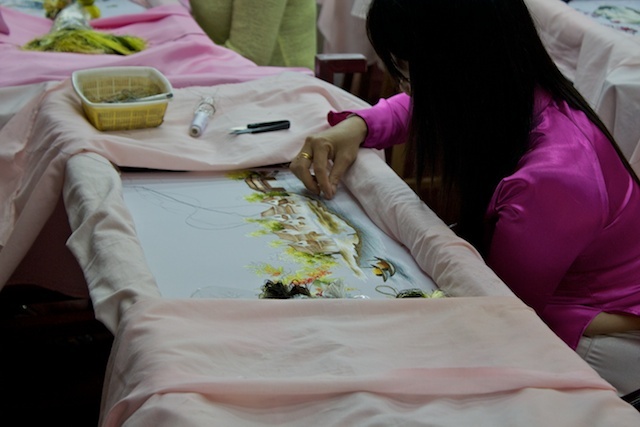 A group of women worked on the top floor, creating intricate embroidery art. The floors below were showrooms of art and clothing items for sale. We saw some beautiful pieces and briefly considered a purchase, but the prices (although real bargains for the quality of work) were a little more than we wanted to spend for souvenirs. 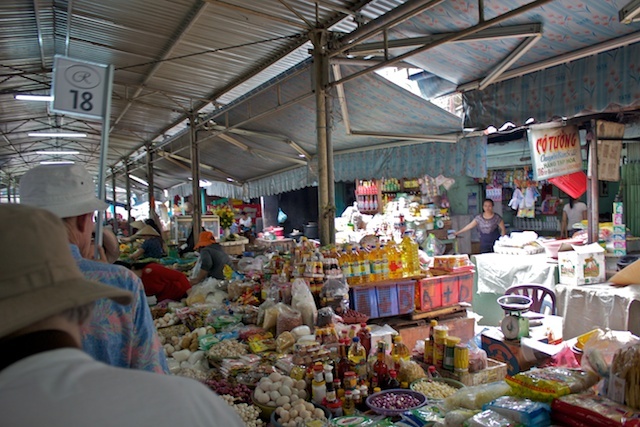 When we left the shop, our guide took us for a walk through the market. Markets in Vietnam are like indoor flea markets, but selling mostly food. Walking through the market was a complete assault on the senses. There was so much for sale it was hard to take it all in. I didn't recognize most of what I saw. Our guide told us that the markets open at 4am and smart shoppers come early. I understand why. There was plenty of fish, meat, and vegetables, but no refrigeration. The bus picked us up after we left the market and took us to a marble carving shop. The marble comes from a nearby mountain. Again, lots of beautiful sculpture art of all sizes. We saw several pieces that would look great in our yard, and they would have shipped, but we resisted temptation. I picked up 2 small statuettes instead. A little ways up the road, we stopped at the "Hell Cave." 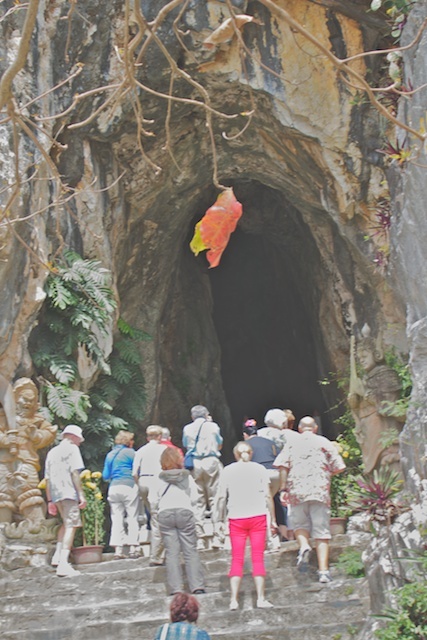 This is a cave in the Marble Mountains that contains Buddhist symbols. There is a Buddhist temple on the mountain high above it, that you can get to either by climbing the mountain or by taking a lift that was recently built. Ray and I started to go in and we got pretty far, but there were lots of stone stairs. When the lighting got dim as well, we decided to turn around and go back to the bus. 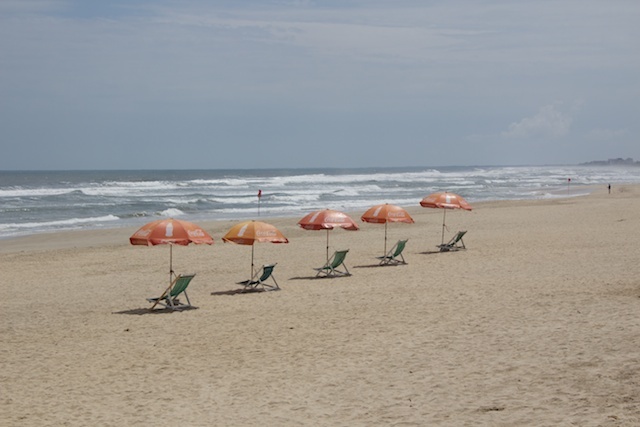 The Da Nang beachfront, Marble Beach, was our next stop. The beaches here are beautiful and a number of very nice resorts have been built in the last 20 years. Da Nang is a pretty modern city. I noticed the big difference between Hue and Da Nang is that almost every business had signs in both Vietnamese and English. This is a city that is definitely looking for English speaking tourists. Our last stop before heading back to the ship was to see the Linh Ung pagoda and Bodhisattva of Mercy statue. This 67 meter high statue looks over the city of Da Nang. 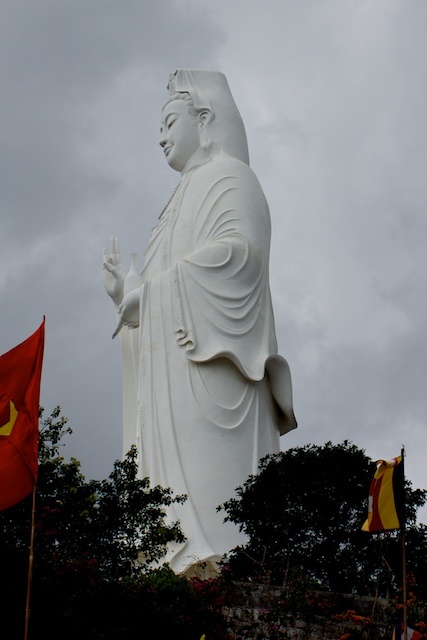 The groundbreaking for the pagoda was in 2004 and the statue is the highest of this subject in Vietnam. As with all Buddhist temples and pagodas, there were lots of steps leading up to it. Ray and I have climbed enough steps between yesterday and today, so we decided to just take photos from the bottom of the stairs. We made it back to the ship about 1:30pm. The ship was scheduled to leave port at 3pm, so we had plenty of time. We got some ice cream at the buffet and went back to the room to watch the sail away. The captain announced that we might have some more rough seas this evening, but it will get better overnight. Dinner should be interesting.